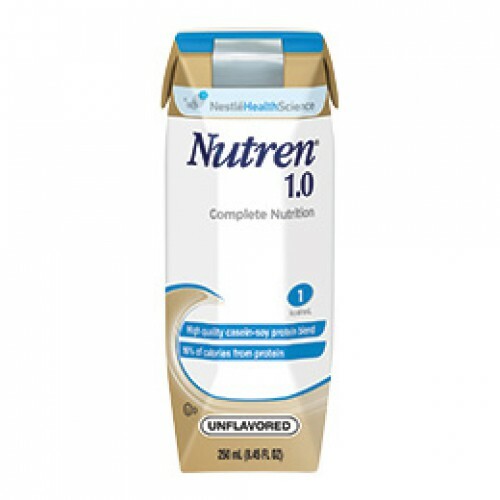 Nutren 1.0 is a complete liquid nutrition that is ready-to-use, manufactued by Nestle. 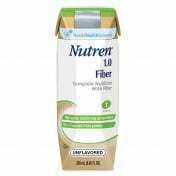 Nutren 1.0 is a liquid formula for complete or supplemental nutrition support. 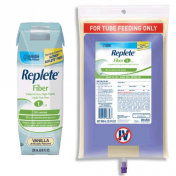 Available in a short- or long-term tube feeding for patients with normal caloric requirements. 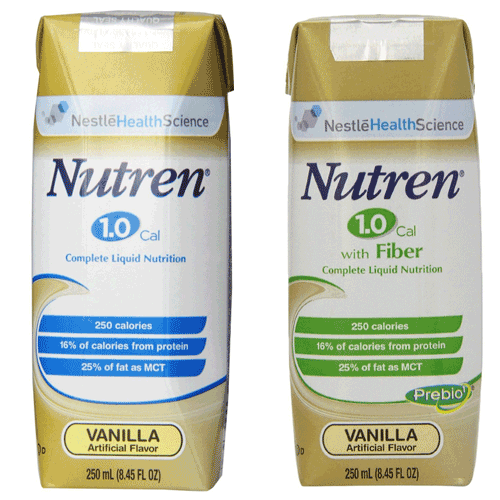 Nutren 1.0 is lactose-free, gluten-free and low-residue. 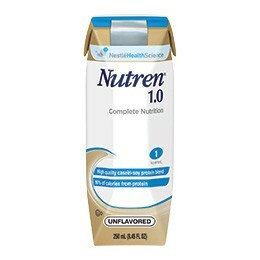 Nutren 1.0 Product Numbers: 9871616056, 9871616210. 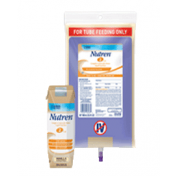 Size Options: 250 mL or 1000 mL. 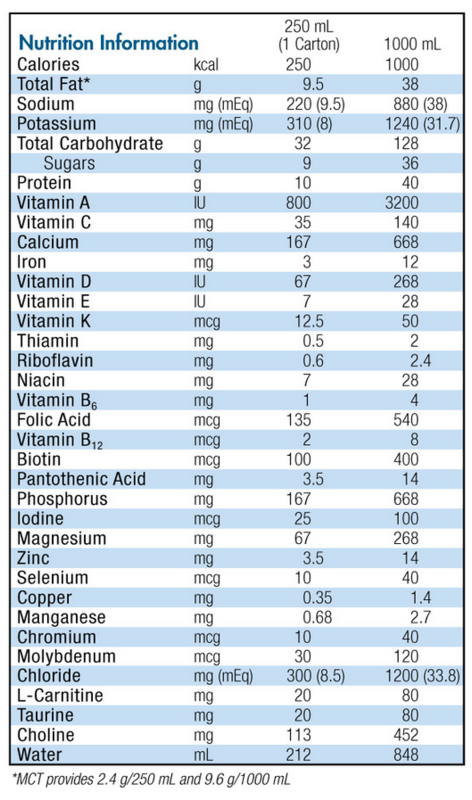 Caloric Distribution (% of kcal). 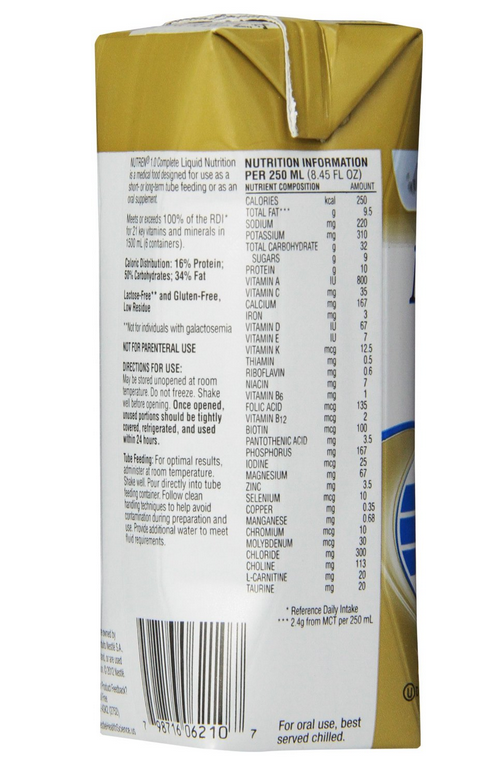 Meets 100% RDI for 20 key micronutrients: 370 mL. 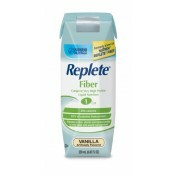 Water, Maltodextrin, Calcium-Potassium Caseinate (from Milk), Sugar and less than 2% of Canola Oil, Medium Chain Triglycerides (from Coconut and/or Palm Kernel Oil), Corn Oil, Soy Lecithin, Potassium Citrate, Artificial Flavor, Calcium Citrate, Salt, Sodium Phosphate, Magnesium Chloride, Citric Acid, Choline Chloride, Potassium Phosphate, Sodium Ascorbate, Magnesium Oxide, Carrageenan, Sodium Citrate, L-Carnitine, Taurine, Alpha-Tocopheryl Acetate, Zinc Sulfate, Ferrous Sulfate, Niacinamide, Dextrose, Calcium Pantothenate, Vitamin A Palmitate, Manganese Sulfate, Color (Turmeric Extract), Pyridoxine Hydrochloride, Copper Sulfate, Riboflavin, Vitamin D3, Thiamine Mononitrate, Folic Acid, Biotin, Sodium Molybdate, Potassium Iodide, Chromium Chloride, Sodium Selenate, Phytonadione, Vitamin B12. 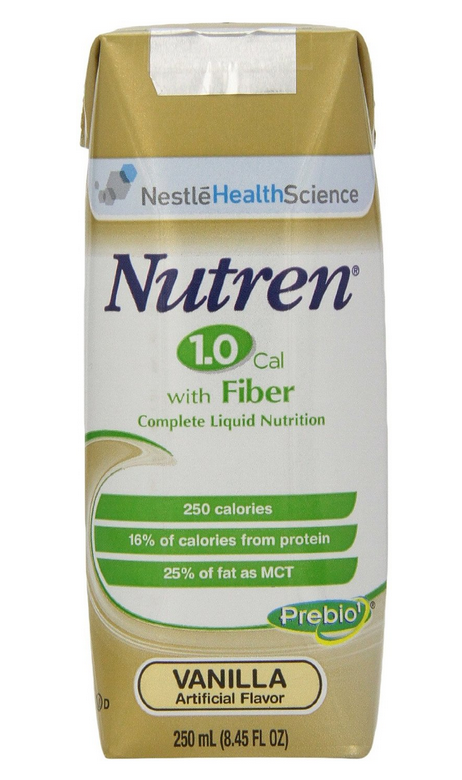 What are all of the ingredients in the Nutren drink? 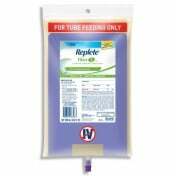 Quick shipping and the new packaging really save time and freight costs. 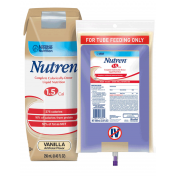 The best price on the web for Nutren!